I'm setting up a test environment for RMS scheling feature integrating with an Office 365 Business Account. I've followed the instruction on the RMS EWS Plugin Instalation manual and I'm facing difficulties on the Configure RMS Service Account on Scheduling Server procedure. 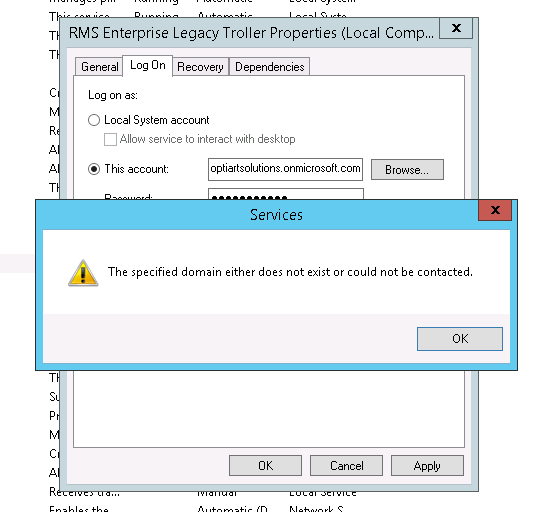 I'm entering the Office 365 credentials at RMS Enterprise Legacy Troller service (my credential is [email][email protected]@onmicrosoft.com[/email] - that is the same one I've used on plugin configuration and everything worked well), but I getting the following error message: "The Specified Domain Either Not Exist Or Could Not Be Contacted" (as per attached picture). It looks like the DNS cannot resolve the address. I've installed the RMS Schedule plugin and RMS EWS plugin in a Windows 2012 R2 Server. It's not the same server of RMS Server. Could someone give me a track to solve that? 1) If the room accounts were made with the web-based terminal for MS accounts it doesn't work no matter how you try. 2) if accounts were created correctly, the permissions for account(s) access are not correct.